Does anyone else still have holiday boxes and decor strewn EVERYWHERE around their home? The tree is up though. It’s halfway decorated. As is the mantel. I made some wreaths and I keep moving them around because I can’t decide where I want them. I just liked making them! So, basically, I’ve totally got it together in the holiday decorating department. On a less melodramatic note, on Monday I shared our trip to Blarney Castle! I’m glad we finally made it over there. On Wednesday I wrote about the facelift we gave our wood dining room chairs without the help of power tools. They look so much better! Here’s what’s on the Happy List this week! I’m still a sucker for a cute craft! This one looks like an ornament you’d find in a store. The idea and step-by-step directions can be found at Lia Griffith. I know friends who are remodeling and I’m just over here living vicariously through their process! It’s so neat to see all of their ideas come to life! 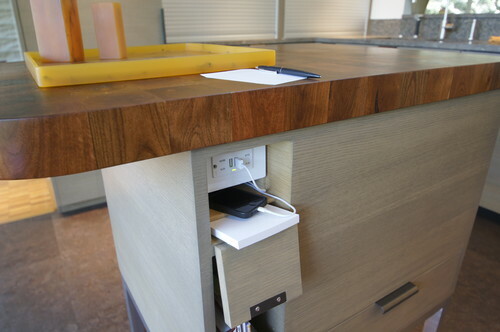 If I ever do another remodel I would love to incorporate some hide-the-tech functionality into the home. 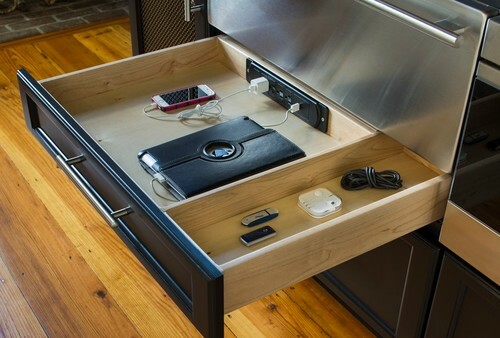 Or a full-on charging drawer complete with a power strip. 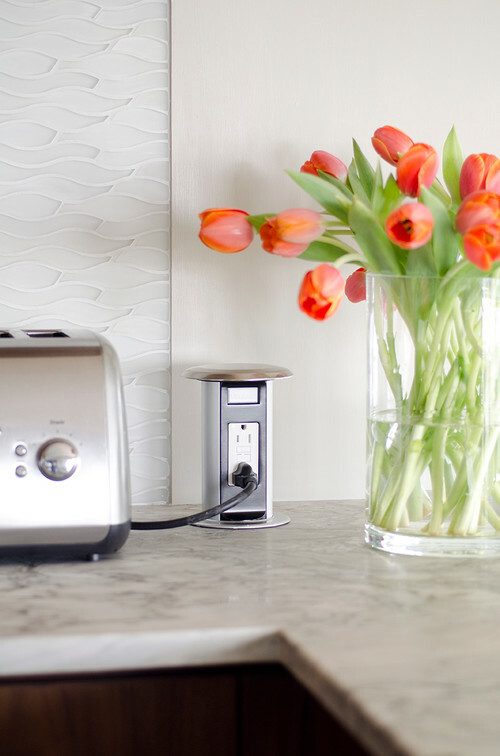 Since I like clear counters and pretty backsplashes, I can see the appeal of a pop-up outlet. This idea would be extremely helpful in desk design too. All images from Houzz . Guys! I have this asymmetrical zip-up hoodie by Tom’s Ware in red and teal and I LOVE THEM TO PIECES. It’s like a sweatshirt, but I feel all put together when I’m wearing it. I have the navy one in my Amazon cart right now as a hint to Handy Husband. I’m 5’9″, a size 8 and I wear the hoodie in a U.S. medium which gives me wiggle room to wear layers underneath of it. (That whole sentence made me feel weird, by the way.) The hoodie is $34.99 at the moment. By the way, I’ve washed these hoodies on cold, but I’ve never put them in the dryer. Hang dry only. Ricotta probably makes these cookies a little healthier, right? Yeah. Probably not. However, these cookies from Giada De Laurentiis still look awesome. And a nice break from the traditional holiday cookie. Maybe I should make them this weekend? Generally speaking, I don’t think hallways add much in terms of aesthetics to a home. Unless THIS is your hallway. Now for a little break from home stuff to get our learning on! This is a well-rounded blog. Ha! The antipodes of any place on the Earth is the point on the Earth’s surface which is diametrically opposite to it. So, if you were to start digging a hole straight through the Earth, where would you end up? My parents always asked if we were digging a hole to China. Turns out they should have asked if we were digging a hole to the Indian Ocean. Ha! There’s a website called Antipodes Map that lets you find the antipodes of any place on Earth. I told my daughter’s teacher about this tool and they’ve already used the website during geography class. This is a fun way to learn something new about geography! Even for us adults who’ve been out of school for a really, really, really long time. I have never been to the Swiss Alps, but can you imagine being there and seeing 2,600 Santas? According to this article by The Daily Mail that’s just what happened this week to open the ski season at Verbier. The pictures of this event just made me smile! How in the world do I get a railing like this? Who makes these? And how many of my first-born would it cost? This photo is from a place in Poland called Villa 11 Folk & Design. Here’s the view of the railing from the outside. The inside of this place is equally amazing. Who wants to go with me?!?! If you have a few wine corks lying around *I won’t mention any names* this would be a super cute and easy craft. All the details and more ideas on how to display these trees are at Live Laugh Rowe. Have you EVER seen a more amazing tree stand? Nope. You haven’t because this is the tree stand to end all tree stands. If you want to see more beautiful pictures from Hollie at Artful Homestead, be sure and check out her Instagram feed. Anyone have holiday plans for the weekend? We actually have a low-key weekend planned, so I’ll have plenty of time to finish up this Christmas tree decorating thing.